One of the most common approaches to saving teeth is called Root Canal Therapy or in dental terminology, Endodontic Treatment. Years ago, diseased or damaged teeth were removed. Today, modern dental techniques are able to save your teeth. Root canal therapy is generally necessary when the pulp, which contains the nerves and blood supply of the tooth, is diseased or damaged. The disease or damage may be caused by a number of situations. The first step taken will be to remove the pulp tissue and carefully clean the pulp chamber and root canals. 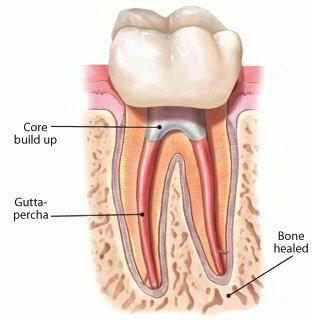 This is done through a small opening in the crown of the tooth. Once the tooth has been cleaned, medicine is then placed in the tooth and it is temporarily sealed. When the tooth is free of infection, the inside of the tooth and canals will be filled with gutta-percha, a rubber-like material, to prevent bacteria from entering the tooth. Once this is completed, the tooth should be restored and strengthened with a crown. Many of the treatments can even be done without local anaesthesia. In most cases our patients find it a time to relax in the dental chair. Sometimes there may be temporary irritation of the tissues surrounding the tooth following treatment. You will be advised of medication to control this.